In today's busy world, there is little time to make a trip to the store. Why fight the crowds? DIY Oil Changes are easier with Walmart.com . On Walmart.com you can find many Pennzoil products. Based on your car's needs and the number of miles, one of these four oils is right for you. For a limited time you’ll also receive $10 Ticketmaster Ticket Cash with a Pennzoil purchase- Just purchase any 2 qualifying Pennzoil Motor oil 5 quart bottles (in-store or online) & upload your receipt. 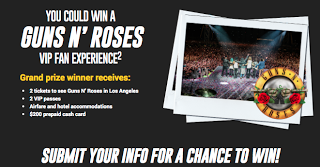 You’ll also be entered for a chance to win Guns N’ Roses VIP fan experience. One lucky winner will get to fly away to see Guns N’ Roses! No purchase necessary. Save yourself a trip to the store and get your oil at Walmart.com today, and get $10 Ticketmaster Ticket Cash with your Pennzoil purchase! *Offer ends 10/15/17. For full details visit the Walmart.com visit the Pennzoil Walmart.com page! This is great for Guns and Roses fans!! It's such a nice giveaway that they can remember and experience for a memorable event! What a great giveaway! That's so cool! I'll definitely have to look into that Pennzoil deal! What a great giveaway! Never have seen Guns and Roses in concert, but would love to! Thanks for sharing. What a fabulous giveaway for Guns N' Roses fans. I heard they were going on tour again. It would be great to hear them live. Wow, what a fun giveaway for a Guns N Roses fan! We use Penzoil products in our vehicles! Not only you get good quality oil for your car you also have a chance in the giveaway. This would be great especially for GNR fans. What this is an amazing giveaway! I loved this band when I was a kid, love that they are back in concert! My husband would love this more than anything ever! Great giveaway for Guns and Roses fans. Walmart.com does come in handy for all sorts of purchases. My husband is a huge g&r fan! He'd love to go to a show! Pennzoil products are my favorite! This is such a good reminder to get my oil changed!